The BCAB Paddlesport Instructor is a 5-day training and assessment course. The primary role of the Paddlesport Instructor is to deliver safe and enjoyable taster/starter sessions in a ‘very sheltered water’ environment. The qualification will support the instructor with practical skills such as kitting up a group and getting afloat, initial familiarisation activities, games and activities to support learning and how to use mini journeys to support learning, inspire adventure and exploration. This will be enhanced with support on how these sessions can be delivered in a way that is enjoyable, safe and rewarding. The qualification aims to help prepare candidates for their first paddlesport instructing role; ‘primed and ready’. 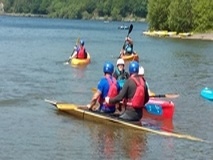 The qualification is designed such that the instructor can choose the craft from which they predominantly deliver and have access to: kayak, open canoe, sit on top, or stand up paddleboard; and can look after others in a range of stable craft kayaks, open canoes, sit on tops, and stand up paddleboards; as both single craft and mixed fleets.